The Transportation Security Agency has long been maligned for making us take off our shoes and go through a metal detector fifteen times before someone is finally happy. This Instagram won't make up for all that, but it's probably the most amusing/informative thing you will see today. Why are you trying to hide blades in a greeting card, bro? The photo boasts a cheeful caption about the fact that all blades must be checked, but mentions nothing about the fact that someone actually hid weapons in a greeting card and what happened to them. I truly believe that this is the new "For sale: baby shoes, never worn" of our generation and if someone knows who this person is, please for god's sake ask them to comment on this because the mystery will kill me if the blades won't. This beautiful collage, which I've entitled This Is Very Likely the Way You Will Die, is not a retrospective of all the horrors the TSA has ever found. These were discovered in one carry-on bag. 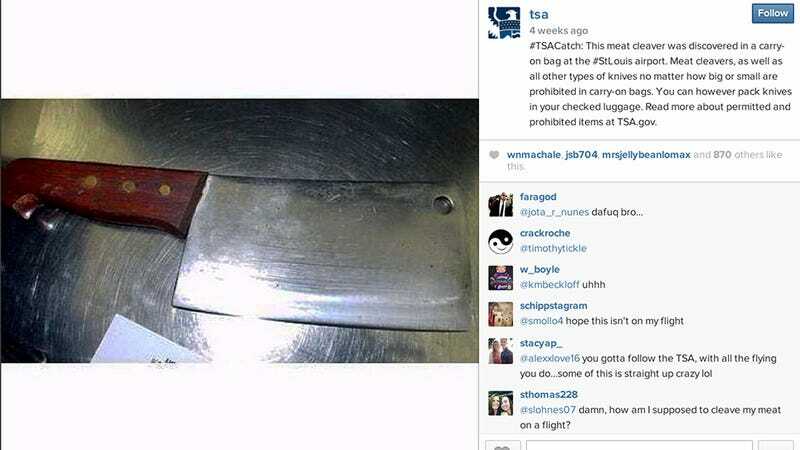 The TSA gently urges you to check with your state to see if silencers are legal before you pack one in your suitcase before a hired hit. This photo is entitled This Is Absolutely the Way You Will Die And Also What Hell Looks Like.